We’ve been having a bit of a refurb at the Wine & Tapas Bar to make the two upstairs rooms more comfortable and welcoming, and Harry has fashioned some new tables on barrels for the downstairs. Let us know what you think of the new look. If you’re in a rush or don’t want to eat in, we have now launched a ‘tapas to go’ service. Working on the assumption that most people will want at least two dishes, we’ve come up with a menu of pairs that work together – a kind of tinder for tapas. 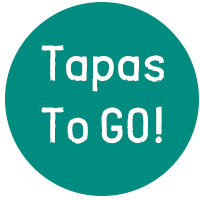 Check out the Tapas To Go menu here. Take it to the pub over the road, take it home, or enjoy it al fresco. We’re thrilled to say we’ve found a supplier of fully compostable takeaway boxes made from bagasse – a sugar cane residue – so keep an eye out for them arriving soon! This entry was posted in Shop News.